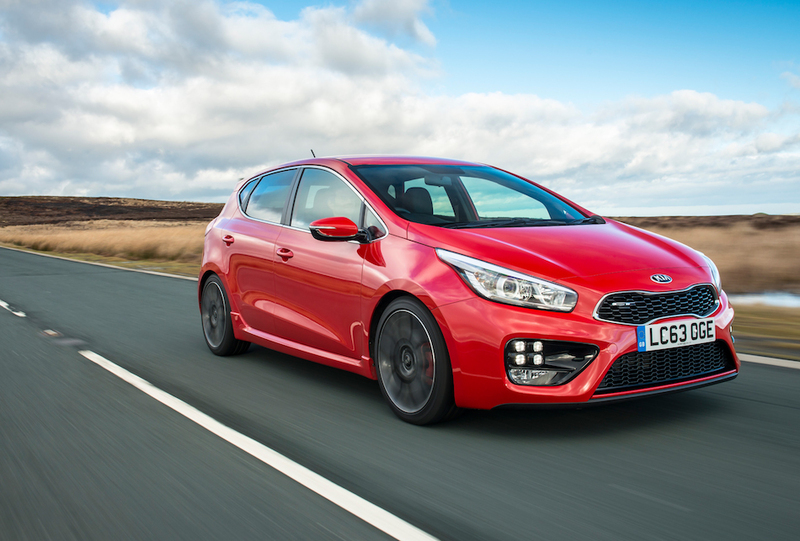 Kia’s pro_cee’d GT caused somewhat of a stir when it was launched last year, combining hot-hatch ideology alongside the Korean firm’s traditional values. With the five-door cee’d GT added to the lineup, is this the performance hatchback that you really can rely on? EngageSportMode traditionally has a rule that you should aways pick the three-door variant when available for a hot-hatch. From Golf GTI to the Audi S3, and everything in between, that has always been our school of thought. But the new Cee’d GT might just be the car which makes us deviate from our usually strict three-doors only policy. Quite frankly, it looks stunning; we’re willing to argue quite vehemently that the GT model’s styling package looks even better here than it does on the Pro Cee’d. Whilst the three-door Pro Cee’d GT is handsome in its own right, there’s something about those additional doors which gives extra aggression to the Cee’d GT’s side profile. We also love the big gaping bumper, Peter Schreyer designed ‘Tiger Nose’ grille and trademark LED ‘ice cube’ DRLs at the front end. Intricate 18″ dark grey alloy wheels and sculpted sills showcase the sides, whilst twin exhausts, gloss black detailing and an obvious GT badge complement the rear. Make no mistake, this is a good looking car. 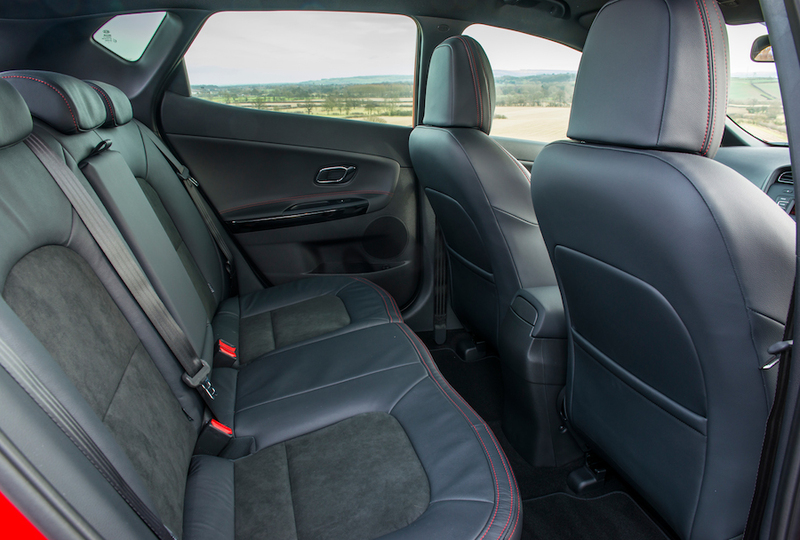 Internally there’s half leather and suede Recaro front seats with ‘GT’ logos, along with sporty red stitching. That contrast stitching also makes an appearance on the perforated leather steering wheel, the leather gear shift gaiter and also on the door trims. 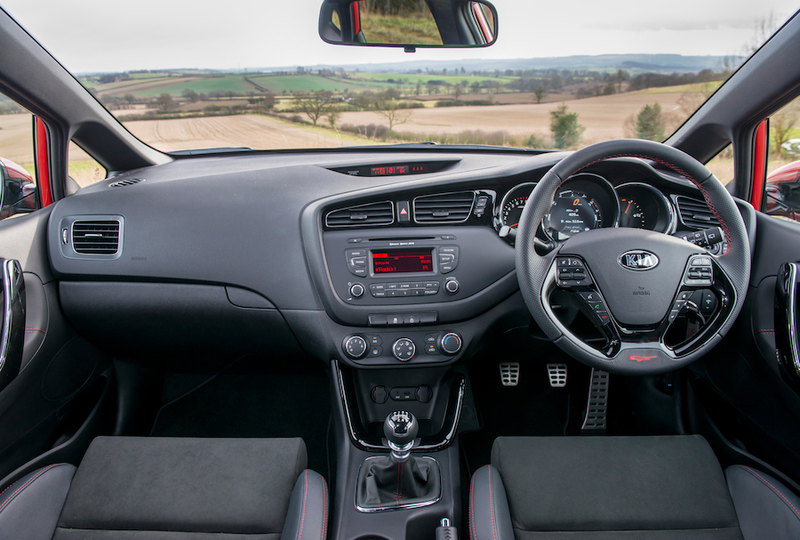 Pleasingly Kia has fitted a very dark black headlining, making the cabin look instantly cocooning, whilst highlighting the gloss black interior trim and stainless steel pedals. A LCD display in the instrument panel offers up the choice of information in digital or analogue format, with readouts for turbo boost, coolant temperature and torque levels available. Unlike most hot-hatches of a similar size, the Cee’d GT uses a 1.6 litre turbocharged four-cylinder power-plant rather than a class regular 2.0 litre unit. Kia claims this forced induction direct-injection ‘Gamma’ engine gives a combination of pace and economy, through using a twin-scroll turbocharger that eliminates lag but boosts efficiency. The result is 201 bhp and 195 lb-ft of torque, channeled to the front wheels through a six-speed manual gearbox, which puts it a little short on power compared to a Golf GTI with its 217 bhp. Handling is enhanced through the stiffer suspension springs, retuned dampers and the addition of a larger anti-roll bar at the rear. Bigger 300mm ventilated disc brakes at the front, with 262mm items at the rear, do the stopping with Michelin Pilot Sport 3 tyres holding everything together in the corners. This colour is ‘Track Red’ with ‘Phantom Black’ and ‘Fusion White” also available. In terms of performance benchmarks, the Cee’d GT hits 0-60 mph in 7.4 seconds (compared to the Golf GTI’s 6.5 to 62mph), and runs on to a top speed of 143 mph – 11 mph down on the Wolfsburg hatch. That still makes the Cee’d GT quick in its own right, but the gap would be easier to overlook if it had the fuel consumption to compensate. Official combined fuel economy is recorded as 38.2 mpg for the Cee’d, which is down on the Volkswagen GTI by 6 mpg. CO2 emissions of 171 g/km place the Cee’d GT in Band H for UK road tax, against 139 g/km and Band E for the Golf. However, before you concentrate too much on the raw statistics, it’s worth considering the GT’s trump card; price. Starting at £20,495 for the base ‘GT’ model, the Cee’d comfortably undercuts the Golf GTI by over £5,000. Which is more than enough to account for the slightly lower fuel economy and extra road tax you’ll pay out on. 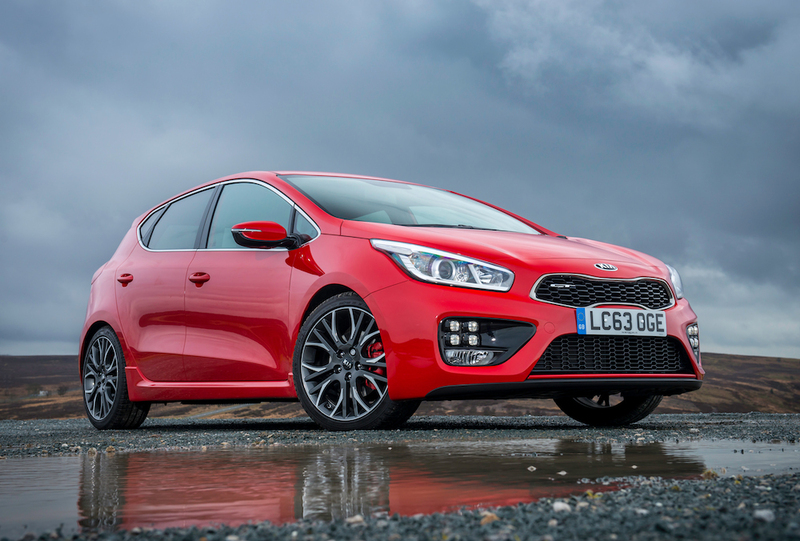 That’s before even considering the potential money savings from the Kia’s standard seven-year / 100,000 mile warranty. Kit levels are comprehensive too, with the base ‘GT’ spec including those Recaro seats with electric lumber adjustment, air conditioning, cruise control, rear parking sensors, Bluetooth phone connection, six-speaker stereo, electric windows and mirrors and privacy glass at the rear. The ‘GT Tech’ model at £22,995 adds a reversing camera, touchscreen Sat Nav, heated front seats and steering wheel, keyless entry, automatic wipers, dual-zone climate control and Xenon headlights. To be honest, there’s not much more you could really think to add to a hot-hatch to make it useable on a daily basis. There’s an awful lot to like about the Cee’d GT, from its good looks and tidy interior to big kit-count and robust warranty. That’s before you even consider the price tag, which makes it something of a genuine bargain and furthers its claim as a livable, real-world proposition. Whether usability matters more than raw performance figures is a matter of taste, but we’re willing to argue the Cee’d GT has enough to cover both bases. Sales start now, and EngageSportMode will hopefully be able to bring you a more hands-on account of the GT in the near future.